Pushing two stops in LR5 from 1600 to 6400, the 6400 is slightly better. Slightly finer grain, no color blotching (D800e.) So yeah, I'll go with the higher ISO up until the spike climbs the wall, thanks anyway, gentlemen. But the X-axis is different, as is the slope at lower EVs. 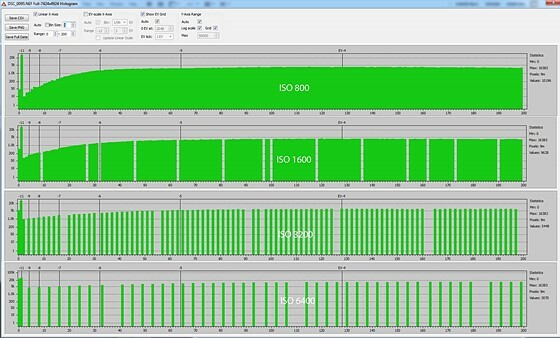 And I don´t see how multiplying ISO1600 values by 4 get you to ISO6400 values (in the graph). Please elaborate (I dont use RAWdigger).